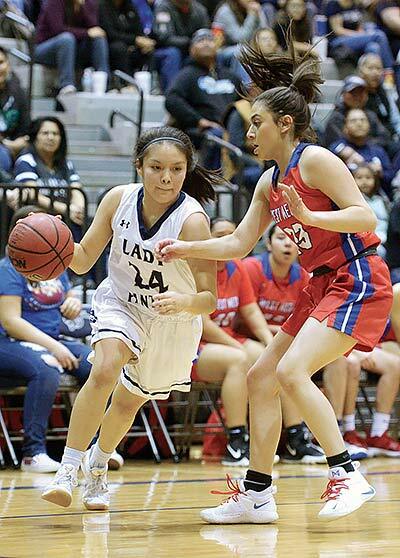 Tiontai Woods, left, drives the ball against a closely guarding Lady Mustang on Saturday in Farmington. Before meeting the top-seeded team in the state, the Piedra Vista High girls’ basketball team vowed to walk onto their home court unbeaten. Piedra Vista head coach Joe Reed said that was key for his team to win against West Mesa on Saturday, 68-55, handing the Lady Mustangs their first and only loss this season. Everything included a strong start to the District 2-5A game. Piedra Vista made a quick 7-0 start before West Mesa tied the game at 9-9 and again at 11-11. The two teams went back and fourth before West Mesa had an 18-15 lead in the first quarter. West Mesa head coach Manny Otero said they did their homework but it only got them so far. In the second quarter, the Lady Panthers went on a 10-0 run before West Mesa scored. Piedra Vista’s swarming defense held West Mesa to seven points in the second quarter, and they took a 36-25 lead at halftime. Reed said his team was a spitting image of West Mesa but the game came down to a few things his team managed to do better, especially early on in the game.